I believe mankind is very important. We should know our self, and want best and beautiful things. Art can help us to know and to be better. This week we present Tara Goudarzi. 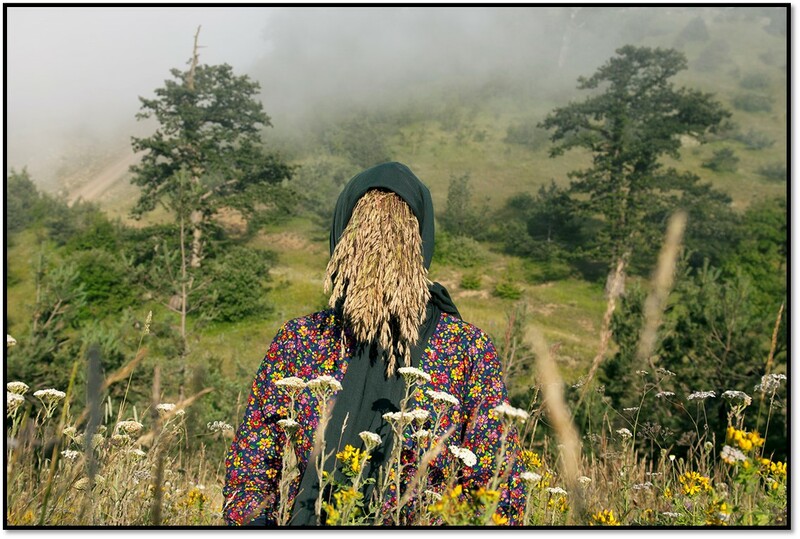 Tara was born in Khorramabad, Iran. She is a 2000 Visual Arts graduate of Fateme, AL. Zahra University of Isfahan. Her artwork carries the concept of identity in her unique way of presenting. 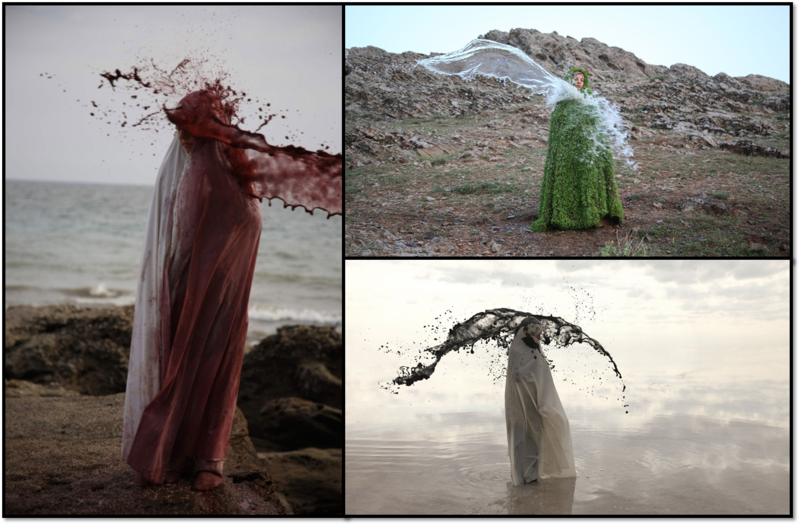 In her performance, she becomes one of the stones of the sea while wondering if she exists or non-exists and trying to figure out “who I am”. 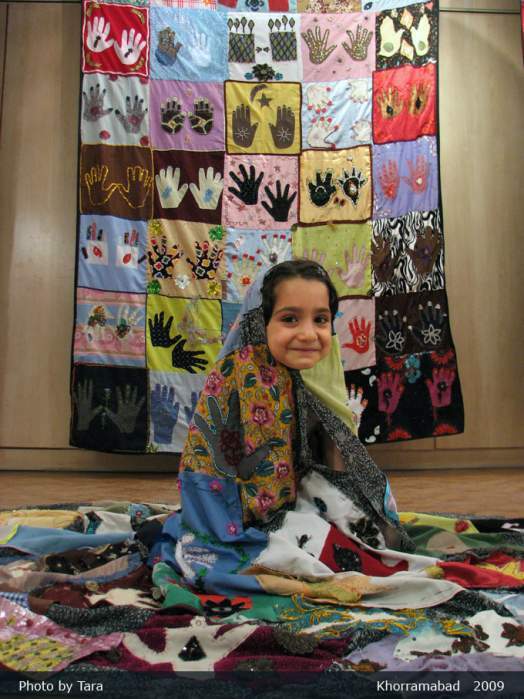 Goudarzi has been a visual art teacher since 2000, and has been managing recycle art projects with participating junior high school students for 5 years. 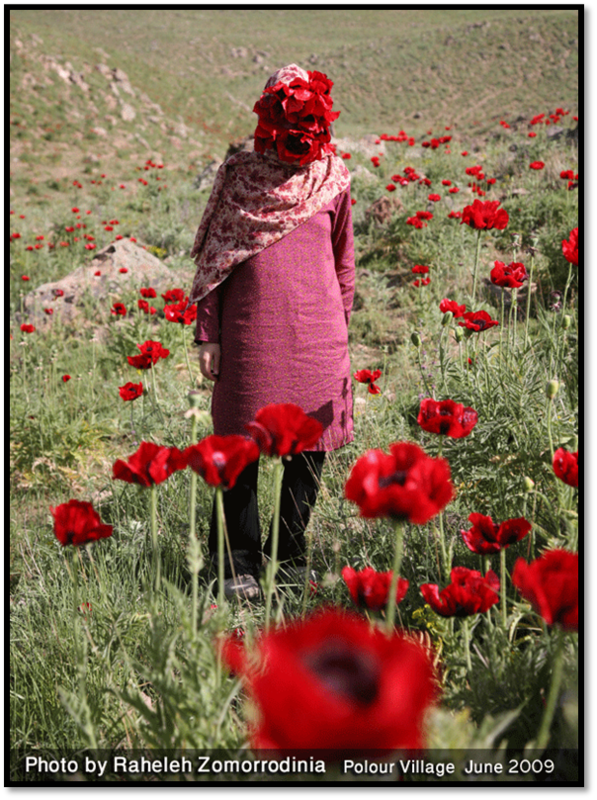 She has participated in video art festivals in France, Bulgaria, and Iran, and group exhibitions in Iran, Canada, America, Romania, Mexico and Korea. We’d like to know who you are. I am Tara. I was born in Khorramabad, Iran. I am a 2000 Visual Arts graduate of Fateme, AL. Zahra University of Isfahan. In 2009 I received my BA in Painting from Shahed University in Tehran. I am a member of the Open 5 Group, Low art Group, Wead, and YATOO International group. I have been a visual art teacher since 2000, and have been managing recycle art projects with participating junior high school students for 5 years. I am interested in performance art, installation art and collaborative art. Where do you usually gather the inspiration for your work? I’m searching for a relationship between myself and the world by exploring my environment and considering such concepts as creation, human, life, death, infinity and…. Is there any particular project you prefer? My favorite is working in the nature or to be with my students. I have been doing some collaborative art works with my students which are mostly environmental. At first I research the social and traditional backgrounds of the local students and find out about the materials that they could work with and afterward I plan for a project which usually takes about several days or sometimes months. Finally, I present them as a performance or an installation. Mostly, materials used are useless or recycled objects. 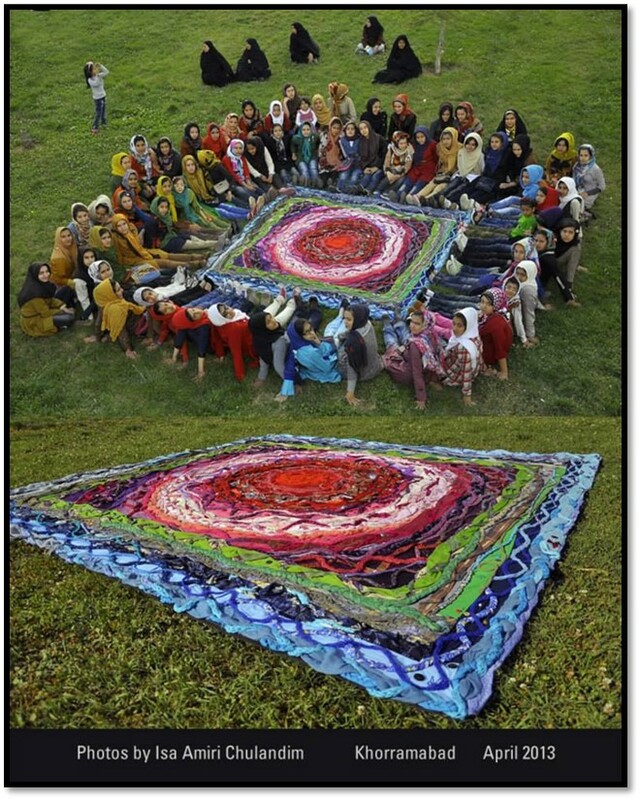 “Woven Imagination” is a collaborative project with more than 250 girls aged 11 to 14 years old and their teacher, Tara (Tahereh). Students have made various woven rugs and other goods using recycled fibers, cloths and beads, with the help of their parents. This project took place in Khorramabad, the capital city of of Lorestan, an old province in the West of Iran, where some of the oldest habitats in history of Iran are found. 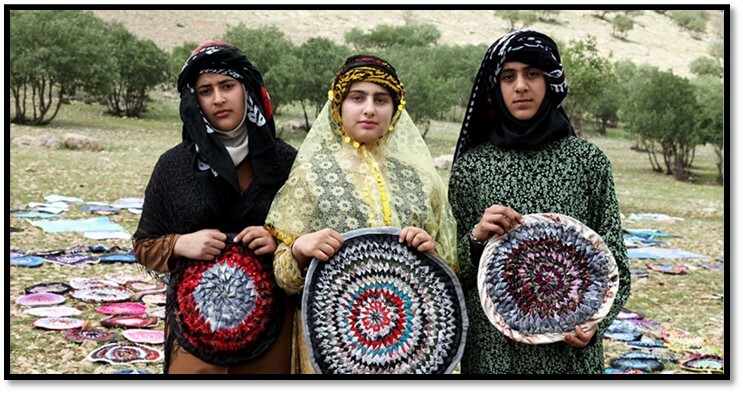 The people of Lorestan are used to recycling, and needlework and patchwork are some of their common traditional recycling arts. Tara’s students made their “Talkale” in a round shape as a human head which also has the concept of eternity. They are made with the recycle materials such as: rags, cloth and fabric. The circle is a symbol of the world. All Talkale installed in the mountain close to Khoramabad city. In the nature, I’m searching to find an answer for my questions. Who am I? And where do I belong to? And…? Tell us your vision of Art? In your opinion, what’s the best thing about being a woman artist? The artist’s women works have many sentiments and their works are layered. Their works have appearance and reality. They show life. Then, what is the most difficult part of being a female artist for you? A woman should work very hard than a man so that people believe her. I usually ask my family and my friends for help and collaboration. 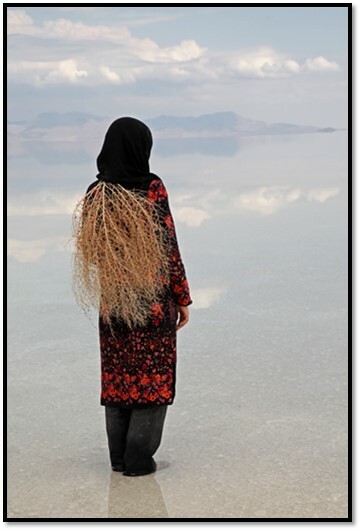 You were born and live in Iran, how does your cultural background influence your work? I’m living in a cultural and traditional family and a traditional community. 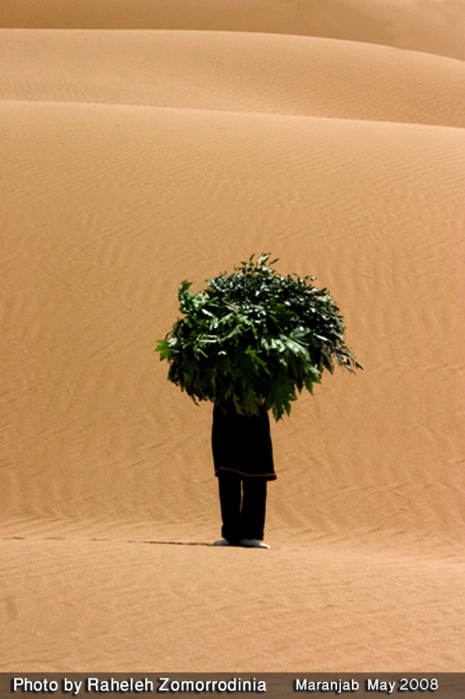 I show my culture with a new form by contemporary art. What would be an ideal project for you? A collaborative art with all the people of the world and showing result to them. I hope my next projects will be for a world without sorrow. Visit Tara’s website to find more interesting art work, and you can know more about her in our Women Artists of the World website as well. This entry was posted in Interviews and tagged AL.Zahara University, BA, Goudarzi, IFWA, International Foundation of Women Artists, INTERVIEW, Iran, Isfanhan, Khorramabad, Painting, Photographer, Tara, Tara Goudarzi, Tehran, the Inspiration, Visual Arts Graduate of Fateme, Women Artist, Women Artists of the World. Bookmark the permalink.